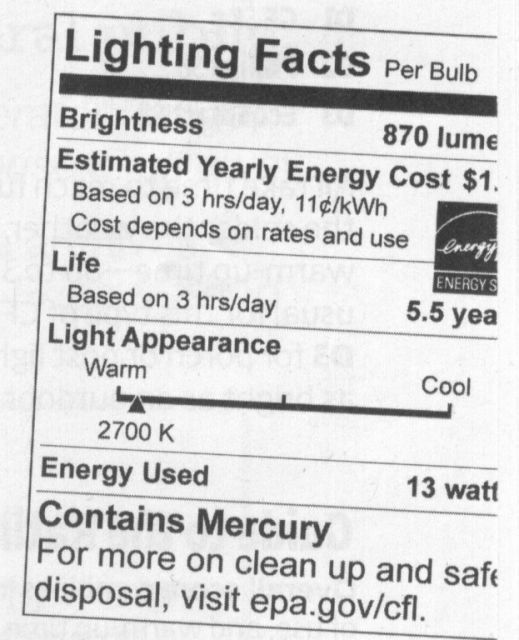 Starting in mid-2011, the packaging of medium base lamps sold in the United States will feature a new Lighting Facts label, which states the luminosity, estimated energy cost, life, color temperature, energy use, and other details. I like the idea of a standardized method of listing lamp data, just too bad it had to be mandated by the government. I would have rather that an industry association (such as NEMA) would have adopted it for all member organizations instead of it being a government mandate. So how many calories from fat? All kidding aside, I agree with nogden. I have had to search all over packaging to find some of this information, so it is nice to have it in a standardized format. It would have been nicer if it didn't take a government mandate to bring it about. Similar labeling directive is mandatory in EU (if i remember well) since Sept. 2010. It require the number printed in largest font to be the light output in lumens - so no "popular" (mainly cheap LED) manufacturer's tricks like "Our 1W LED is comparable with regular 60W incandescent, as it has the similar brightness from the front side". I think this is the first directive I 100% agree and the one (and only one) i would keep in force. It (by itself - don't mix with progressing incandescent bans) does not limit any light source, but it allow customers to make at least partly informed decision. This is a joke, now they have nutritional facts for lamps? I have always argued that the primary "fact" should be lumen, not wattage. When I buy a lamp, my first concern is meeting a desired light level, then I will find the lowest wattage lamp. Therefore, light output is the most important factor and it should be the "big" number! This is only becoming more true as different light sources become available. I am missing the value for lumen per watts. That would be good to have a feeling for the efficiency of the lamp. You are right, I didn't notice that at first. I agree, efficacy would be helpful! I suppose you could compare lamps based on yearly energy cost, but that's not as helpful in my opinion. That could work pretty well! Since it is based on the nutritional facts label, most people already know how to read them. You have a lighting task and that require certain amount of lumens, so you have to select the lamp just above that level. And then select the lamp with (i guess) lowest "total cost of ownership" fulfilling all other needs. That mean if you need 800lm of light, you will likely choose 11W PL-S and not 36W TL, even if the 36W one has higher lm/W figure - it simply consume more electricity, while the extra light you do not need for the task. I would even say the "lm/W" figure would be counterproductive to have it too much "on the top of the list": It would yield to false perception, then higher lm/W figure is better for any task, regardless if the amount of light is really needed, so too high installed power (e.g. installing 80lm/W PL-S 11W to place, where the 7Water with only 50lm/W is enough). And when it some to dimensionning some installation (or retrofit), i think people can calculate a sum of lumens as well as sum of watts and then compare, so the lm/W is not necessary either. Cute labels, but I would find them more interesting if they actually listed the mg's of mercury, iodides, and the types of phosphors used. One thing that i don't succeeding to understand about the Energy Star controversial rule on electronic ballasts in USA, is why it don't allow the electronic ballasts of household fluorescent fixtures to preheat the electrodes!?!? Barely one second of preheating wait period isn't allowed by the Energy Star for electronic ballasts of household lanterns. As a result ALL of the household electronic ballasts in USA are instant start, meaning MORE LAMPS REPLACEMENTS and MORE MERCURY POLLUTION. Not surprising that all of the europan electronic ballasts are either rapidstart or programmed start and in Israel, the instant start electronic ballasts marketed are all chineses. Edit: This is one of the reason why i planning, that the future ceiling fixture in my room of my hostel, will be a fluorescent fixture for one 21W T5 HE from Gaash lighting, since it will contain a Helver made electronic ballast that i'm sure it will be a programmed start ballast, resulting in fewer lamp replacements, since the lifespan of the lamp (Depending on the lamp quality) may be similar to that of the HPS or even the MV lamps. @dor123: This is strange, are you sure you understood it well? The EU directive i read recently specify max startup time separately for ballast without preheat and separately with electrode preheat, so the less then 1 second limit apply only for those without electrode preheat. dor123, I am not familiar with the directive you are talking about. How recent is it? Program rapid start electronic ballasts preheat the electrodes and are Energy Star compliant, as far as I know. Maybe electrodes can't be continuously heated, but I'm pretty sure they can be preheated. It is rare to find a residential fixture or CFL that's programmed start anymore, but I think that is more manufacturer's choice trying to cater to the general public's desire for incandescent-like "instant light" than any regulations out there. Medved wrote:"@dor123: This is strange, are you sure you understood it well? The EU directive i read recently specify max startup time separately for ballast without preheat and separately with electrode preheat, so the less then 1 second limit apply only for those without electrode preheat." @Medved: I saw a post in this site in the past, that one of the users commented that Energy Star program limits preheating time for household electronic ballasts and electgronic CFLs to less then 1 min, results in more instant start ballasts and CFLs marketed for homes, in the US than in Israel. Perhaps this was my imagination, since i don't find this post these days. Perhaps the limit of the 1 mins is only for instant start ballasts, since instant start electronic ballasts, sometimes have longer time to ignite the lamp (Longer time in cold cathode mode. Ie... a Philips Genie lamp we have in my father room). In this case the lamp will behave similar to fluorescent lamps ignited by american HPF rapidstarts (The lamp will be in lower brightness for several milisecs and then will reach full brightness). @dor123: With the "startup" i mean the time to start emitting at least some light, these are in the range one to few seconds (and the max 1 second limit in the EU apply for lamps without electrode preheat). Other timing parameter (required by the EU directive to be specified on the "lighting fact" label) is the "warmup time" as the time required from the turn ON to reach given (in EU 90%) brightness. This time is usually about one to few minutes. I don't know the EnergyStar in such detail, but the one minute limit look more like the "warmup time" specification (and it look like it mean till 70% brightness, but i'm guessing here). @Jace: So "programmed start" include explicit preheat step (i.e. only electrodes are heated up), so the arc is ignited after electrodes reach operating temperature, so yielding long cycle life. Such ballast is considered as "with electrode preheat" by the EU legislation, so the time to the ignition may be longer then 1 second. The "rapid start" heat up electrodes only in the implicit way, i.e. the ballast deliver some (implicitly limited) OCV to the not yet ignited lamp and at the same time send (quite large) current into the filament, what heat them up. And after some time (high 10's till low 100's of ms) the filament temperature rise so the arc ignite (so the lamp "start"). And after the ignition the arc continue to heat up electrodes, till they reach operating temperature (~0.1..1sec). Problem is, then with some ballast tolerance variation the OCV is frequently so high, it ignite the arc immediatelly, leading to severe sputter and low cycle life. This ballast is considered as "without electrode preheat" by the EU law, so they should ignite within 1 second according the EU laws. So i think we haven't rapidstart electronic ballast in Europe, if they aren't different in behavior then their magnetic counterparts. So electronic ballasts that preheats the electrodes by means of a PTC (Non programmed start), can also be called "preheat" or "preheat electronic ballasts". The PTC controlled preheat belong officially to the "programmed start"/"with electrode preheat" category as well. It does not matter, how the timer for the preheat phase is implemented in the ballast: If by heating up temperature sensitive device (so the pawer dissipation on it, it's thermal capacity and the threshold temperature are factors "programming" the time; simple, but lack the "reset" for hot restrike and is quite inaccurate), charging up some capacitor (so the charging current, capacitance and comparator threshold voltage are factors "programming" the time - a bit better accuracy and has the "reset") or by digital counter (the counting frequency and the threshold number are "programming" the time; regardless if it is implemented as HW digital or as part of the u-controller firmware - best accuracy, but most complex) - all belong to the same. I remember when this first came out and I thought it was something optional manufacturers did.